A simple lab coat makes a great test project for a custom coat pattern designed to fit your doll. Lab coats are made from lightweight fabric, and have few seams, making them a good check of your custom pattern lines and fitting ease. Once you have tested your coat pattern with a lab coat, you can adjust or modify the pattern for a range of jackets and coats, made from all kinds of materials. I wanted a slightly grubby, worn looking lab coat, so I searched through my 'rag' pile for a piece of a cotton percale sheet. Worn sheets, worn denim shirts, worn white dress shirts, or Oxford cloth blouses will also give you lots of fine fabric to make a simple lab coat. If you can't find suitable fabric in small amounts, try a quilt shop for plain cotton fabric, for smaller dolls a 'fat quarter' will provide enough fabric. Another source of good plain, inexpensive fabric is a single pillowcase from a bargain store or thrift shop. - You can make buttons from polymer clay for your lab coat and use a velcro closure similar to the one used to close a simple doll shirt. To make a lab coat for a doll, you will first have to make a basic coat pattern, customized to fit your doll. Once you have the three main pattern pieces made, cut out two arm pieces, two coat fronts, and a coat back from lightweight woven cotton. The pattern pieces should be cut out, so the lengthwise grain of the fabric runs parallel to the fronts of the lab coat, and to the center of the lab coat back. The lengthwise grain should also run down the center of the sleeve. Knits are not suitable for this first test of your coat pattern. Worn fabric from blouses, shirts or pillowcases is easier to work with than stiff fabric off the bolt. Choose fabric which suits the size and shape of your doll. In addition to the main pattern pieces you will need pockets made from small scraps of material, and a small piece of fabric to make the collar. You will also need to cut out two front facing pieces which match the front edges of your jacket. See the step on facings to work out how to cut these pieces out using your main pattern. Sewing Tips - you can hand sew the lab coat or use a sewing machine. If you use a sewing machine to stitch small pieces, lay a piece of tissue paper or printer paper under your fabric before you sew your seams. This will help prevent the tiny seams from being pulled into the throat of your sewing machine. If your chosen fabric frays easily, use a product like fray check or PVA glue to seal the edges of your fabric pieces before you begin to sew. Start by putting the "wrong" sides of the front and back pieces of your basic coat together at the shoulders and sew your seam. I suggest you try sewing 1/8 inch seams to hold your pieces together either with a backstitch if hand sewing, or using a fine stitch on your sewing machine. When you have sewn the seams, finger press them open, or press them with an iron, taking care not to stretch the neck area out of shape. It is easiest to stitch the sleeves into the armhole when the parts are flat and join the underarm seam and side seams later. Note which is the front and the back of your arm, and pin the right side of the sleeve fabric to the right side of the back and front sections of the lab coat along the sleeve seam, pinning or basting the sleeve in place so that the seam will be on the wrong side of the fabric. For your first coat, I suggest you hand baste (use a loose running stitch) the seam along the seamline, then stitch it carefully by hand using the backstitch, or by machine, laying a piece of paper under the seam edge to keep the seam from pulling while you sew it. Once you have the sleeves set into the lab coat at the shoulder, test fit the coat to the doll by draping it over the doll with its arms outstretched. You should be able to see that the front of the coat will overlap slightly, the sides of the coat will line up with the sides of the doll, and the sleeve will fit over whatever shirt the doll is wearing. If you notice problems cut new pieces or adjust your sewing, so the coat fits the doll properly. When you are sure, the coat will fit, turn up the lower edge of the sleeve to the inside of the jacket (the side with the visible seams) and stitch along the fold line on the right side of the sleeve to hem the bottom of the sleeve. With the sleeves attached at the armhole seam, it is time to fit facings to the front of the lab coat. To make the facings, use the coat front pattern and cut two sections which run from at least halfway through the shoulder seam, to the front edges of the coat. (see photo) You will sew the front edges of the coat to the front edges of the facing, keeping the shoulder seam free, and sewing only the distance across the top of the coat into the neckline that you want the front lapel notch to be. For smaller dolls this may be less than 1/4 inch, for larger dolls, it will be further. Once you have sewn into the neck area by the amount you want for your lapel notch, turn the facing to the inside of the coat and press it flat, keeping the corner neat and square at the neck edge for the lapel. Notch the seam at the neck edge with a pair of sharp scissors, so you can turn the neck edge seam edges which have not been sewn to the lapel, so they are free of the lapel section. The horizontal front section in the photo shows the seam notched so it can be turned away from the corner of the lapel. When you have the front facing seam sewn, turn over the other unfinished long edge of the facing and stitch the edge so it will be turned under when the coat is turned right side out. This will finish the facing edge. The photo shows a finished facing attached to one edge of the front (the horizontal piece) and a vertical facing, separate and not attached to the front of the lab coat yet. If your doll is a suitable scale for you to make pockets for your lab coat, you can make and attach the pockets while the side seams are open. Fold over a strip of scrap fabric roughly double the width you want for the length of your pockets. Lab coats usually have a small pen pocket and two lower pockets. Stitch across the fold, 1/16 of an inch or less from the fold. Cut the strip to make two matching lower pockets, each cut, so they are at least 1/4 inch wider than you want the finished pocket to be. Turn in 1/8 inch on each side of the patch pocket and across the bottom. Press the pocket to make it as square as possible. Pin the pocket in place on the front of the lab coat, keeping the facing free. Baste the pocket in place on the lab coat. Stitch the sides and base of the lab coat pocket as close to the pocket edge as possible. Make sure you put a bit of paper under your fabric to keep your stitches from bunching up, and to prevent your pocket from slipping. Remove the basting stitches and press the front of your lab coat, turning the facings inside at the front edge. Repeat the same process on the other side of the lab coat, making sure the pocket on the second front lines up with the matching pocket on the other front. The length of the upper collar on a standard coat or jacket with a lapel is determined by the distance around the neckline. To measure how long a collar you will need to make, lay a piece of colored thread or string along the neckline seam of the lab coat, from the notched edge of the lapel on one side to the same edge on the other side. Trim it to this measurement, which will be the correct length to make the collar. Use the length of your string or thread, to measure out the neck seam on a collar cut on the bias across the grain of your fabric (this will make the collar slightly stretchy and easier to work with.) Sew the ends of your collar at an angle as shown in the photo above. Turn your collar right side out, and use a small toothpick or a pair of tweezers to make sure there is a slight point on the collar if possible. When your collar has been turned right side out, press it in half and set the fold line of the collar. Now turn one of the open ends of the collar neck edge inside the collar along the collar seam line and press it against the collar. This pressed edge will be turned over the seam edge of the collar that is sewn to the neck of the lab coat, sandwiching the lab coat neck seam neatly inside the collar. Once you have pressed the collar, so one side of the neck seam is turned inward, you can baste the collar to the neck edge beginning where you cut the seam free of the front lapel and facing and sew it in place. To make the collar easier to roll on the doll, stretch it slightly as you sew it to the neck edge. You can sew the collar, so the unfinished seam lies against the doll's neck, or so the unfinished seam is against the back of the jacket, hidden by the turned collar. It doesn't matter which way you sew it on; it is just a preference for your finishing style. Once the collar is sewn to the neck edge, trim the seam if necessary and turn the open edge of the collar over the seam, sandwiching the seam between the layers of the collar. Hand stitch the open edge of the collar closed covering the seam. To finish the dolls lab coat, join the sides of the sleeve together at the underarm, matching the lower sleeve edge and the armhole seam. Stitch the sleeve and the side seam of the lab coat in one as shown. To finish the lower edge of the doll's coat, turn the facings wrong side out and sew across the base of the facing and the front of the coat, catching the bottom edge of the coat where it will be inside the front facing when you turn it to the inside of the coat. Repeat on the other side of the coat front, making sure your seams are the same distance up from the bottom edge of the coat so your hem will be even on both sides. Turn up the rest of the coat bottom edge and stitch the hem up inside the coat, stitching from the right side of the coat so the stitching will be even. If you have enough fabric, turn the hem edge over so the rough edge of the fabric is on the inside of a folded hem, protected from fraying. To turn the coat right side out you may need to use hemostats or bent nose tweezers to turn the sleeves. To finish the coat you can sew on miniature buttons made from polymer clay or add small pieces of velcro to the coat facings to hold it in place when closed. 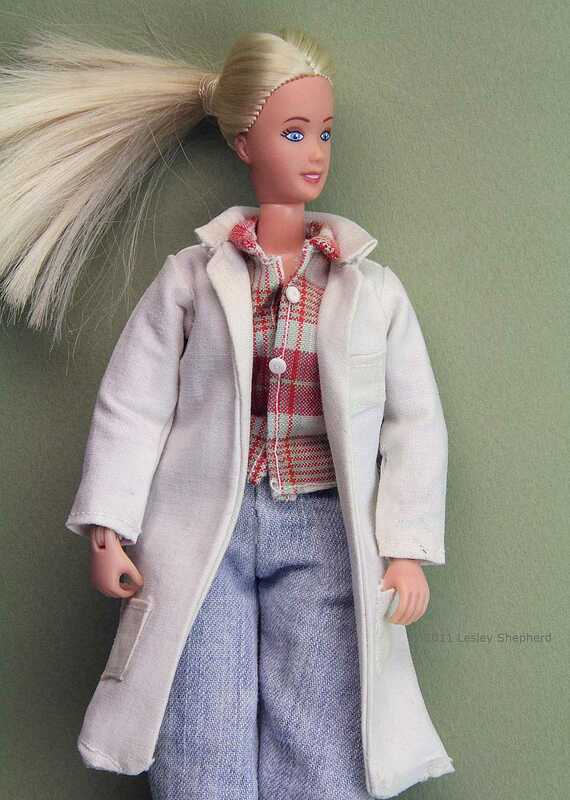 Once you've finished a lab coat that fits your doll, look for other fabrics to make a range of jackets and coats. Fine Italian wool suiting scraps may be available from a local seamstress and will make good wood coats for dolls. Nylon scraps can be made into wind jackets and felt into peacoats and duffle coats. Experiment and see what costumes you can sew from your basic jacket pattern!